It's been a while since I have actually listened to any improvised music album. Not because I have lost interest in it but merely because of the fact that I needed to refresh myself and stop at some point to listen materials only for the fact of gaining some knowledge which lacked enjoyment which in this case stems from the fact that I was a bit tired with this form. Honest truth no hard feelings. Both artists here - Korhan and Gunnar - are known for their involvement in experimental scene - active on many other fields apart from improvisation itself but also sound art and composition. 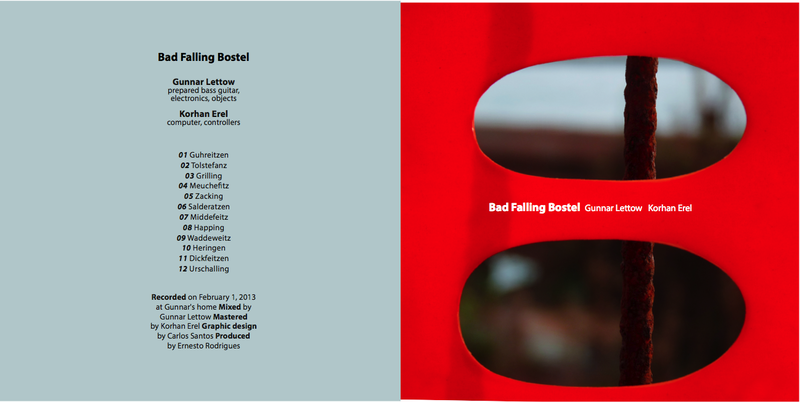 Bad Falling Bostel has a great atmosphere from the start which I would like to focus on rather than just explore the theoretical part which might take too overblown and exaggerated shape, too much of a coincidence with free-improv ghost. Both of the artists have definitely mastered a very tough cookie job of listening to each other and react to what they actually produce or reproduce when it comes to the compositional techniques. Korhan's taking a lead in very unorthodox approach to electronic instruments - using Wii and iPad as choices of primary weaponry - in the utmost fantastic effect - having said that I must admit that controlling as he does it is very rare - and emulating the sounds - transposing them into electroacoustic second half of Gunnar is done gracefully with deep intuition and self-orchestrated drive. Gunnar on the other hand has done a tremendous job on mastering different acoustic devices, twinkling, screeching, squeaking and howling - putting them in the background or as a lead. I like the narrative bit that this album has, a very unique thing about albums I might have put into similar file.